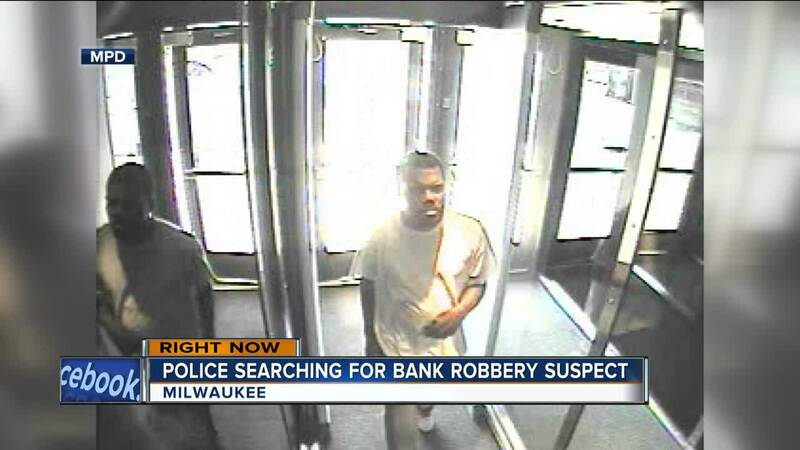 MILWAUKEE -- Milwaukee Police are looking for a suspect wanted in a bank robbery that occurred on Saturday morning. It happened around 10:15 a.m. at the Associated Bank located at 7900 W. Brown Deer Rd. According to police, the suspect entered the bank, passed the teller a demand note threatening to kill everybody in the bank and himself, unless given money. The suspect then threatened to blow the bank up if the tellers pressed any alarms. Police say the suspect is a black male between the ages of 30 and 35, 5’05 to 5’08, with a medium build, a low cut hair, facial hair, and a medium skin complexion. The suspect was wearing a white t-shirt over a white tank top, faded blue jeans and was seen exiting the bank’s parking lot in a blue 4 door PT Cruiser. Anyone with any information should call police at (414) 935-7360.